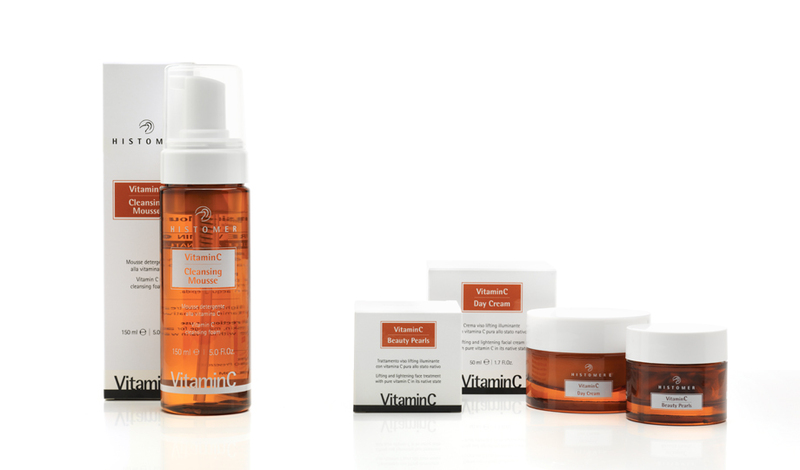 Vitamin C is the ultimate Histomer solution to give to your skin pure Vitamin C as in nature. Histomer Vitamin C is the first cosmetic face line based on an highly stable kind of pure Vitamin C with an extremely high biological activity, called VITAMIN C NATIVE COMPLEX (vitamin C at its native condition). Vitamin C Native Complex is an extraordinary active complex in which pure Vitamin C (Ascorbic Acid) is combined with another strong and powerful natuarl substance called Ellagin C (Ellagic Acid). This combination between these substances is able to fix in our skin tissues in a stable, deep and long-lasting way, granting and showing extreme better results compared to the ones obtained with only Vitamin C.
Vitamin C is naturally an unstable substance and for this reason can be found in many others alternative solutions, called “stable derivatives”; these derivatives are extremely less efficacy than pure Vitamin C and also less active from a biological point of view . Vitamin C helps to develope 5 intensive actions: anti wrinkle, anti dark spots brightening, adaptogenic, dereddening, moisturising and nourishing.